Movies like Knight and Day are so much better when the stars involved have chemistry between them. It probably wouldn’t have worked as effectively as it does without Tom Cruise and Cameron Diaz in the leading roles. Having starred together in 2001’s best forgotten Vanilla Sky, the actors clearly enjoy each others’ company; the discernible comic and romantic vibes between them make the otherwise formulaic spy yarn (filled with devices like the Meet Cute and the MacGuffin) something special. Filled with lots of action and laughs, and with a pinch of romance, the film makes its brand of light viewing easy. 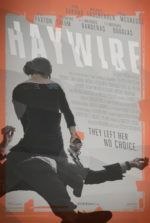 The story involves your average damsel, June (Diaz), meeting superspy Roy Miller (Cruise) through a dull Meet Cute, which thrusts her into a complicated scenario involving double agents and nonstop chases. Roy is pursued by federal turncoats who want the Zephyr, the film’s super-battery MacGuffin, invented by a gawky wiz-kid (Paul Dano, behind a dreadful false mustache). For some reason, Roy brings June along for the ride. Seedy agent Fitzgerald (Peter Sarsgaard, using a baffling accent) tries to convince June that Roy is a rogue agent because he wants to sell the Zephyr himself. However, June can’t help but trust Roy because he keeps saving her life in a Superman/Lois Lane-like relationship. That he’s intelligent, has lightning-fast reflexes, and glows with dreamily good looks doesn’t hurt either. Cruise proves that he’s still a major movie star despite his couch-jumping public persona, as he commands every scene he’s in and remains charismatic to the end. There’s a short time early in the film, somewhere between him killing thugs on a near-vacant airplane and rescuing his damsel from CIA goons in a highway shootout, where it’s suggested Roy might actually be a dangerous, possibly crazed agent. It would’ve been interesting to see another version of this film where that’s true, but Cruise is in full action hero mode here, captivating and charming and dashing as if his roles from Mission: Impossible and Jerry Mcguire were spliced together. After unremarkable turns in Lions for Lambs and Valkyrie in the last few years, it’s good to see him return to the sort of role that made him a household name. Opposite Cruise, the normally grating but always smiley Diaz works in the role of June, making her frantic I-can’t-believe-this-is-happening-to-me act hilarious, while at the same time making sure we understand why she’s so drawn to Roy. There’s a hilarious sequence where June, while sedated so Roy can handle bad guys without being distracted by her hysterics, falls in and out of a drugged sleep during their capture and escape. Seeing through her eyes, we watch blurry flashes of Roy dealing with impossible situations but always reassuring her with his customary line “I got this!” Later in the film, Diaz shines again when she’s given a truth serum and playfully taunts her captors—it’s the funniest scene in the film. You might begin to wonder why Roy needs to bring June along on his trek, but without her, this wouldn’t be a romantic actioner, so it’s a plot hole worth overlooking. What makes the film work, however, is the chemistry between Cruise and Diaz and their characters’ dismissive attitude toward the plot. They’re both involved in keeping the MacGuffin away from the bad guys, but they almost never discuss the details of the situation. There’s never a scene where Roy sits June down to explain everything to her, thus the audience, and in that way, the script respects its audiences to fill in the (modest) blanks themselves. 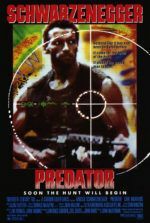 The plot is propelled by action and an unending stream of well-written banter by credited screenwriter Patrick O’Neill (though there were several uncredited re-writes, including one by Minority Report scribe Scott Frank). And beautiful location shooting in Austria, Spain, and Jamaica help keep the audience preoccupied with visual stimuli. But it’s Cruise and Diaz that keep this film alive. The film’s exciting and riotous first half almost does the latter portion an injustice by being so daft and unpredictable. The pre-release trailers contained only scenes from the first half, and when the second half comes around, the scenes are disappointingly not surprising at all. The film’s attempt to make us believe that Roy is indeed a rogue agent, just before his character supposedly dies, proves eye-rolling. This is a summer movie after all, so of course Cruise isn’t playing a crooked spy, and of course, his character didn’t die when there are forty minutes left to go. As an audience, we sit there waiting for Cruise to return to the screen and save the day, which he ultimately does, but the scenes to get through this transition could have been trimmed. The CGI special effects during the action scenes could have been cut down as well. Though Cruise visibly does many of his own stunts, which include rooftop leaps (Cruise is the best runner of all actors) and some impressive stunt driving, there’s also an abundance of computer animation. As we learned from the computer-generated bear in this year’s The Wolfman, Hollywood has given up working with animals and has decided instead to render all animals onscreen with computers. From Spanish bulls that chase after Cruise and Diaz on a motorcycle to some shoddy birds, the effects are distracting. And given the undeniable chemistry of the stars, it’s a shame the filmmakers didn’t realize they have a perfectly charming piece of entertainment thanks to the leads, without over-the-top action that requires no end of only-just-serviceable effects. Genre-jumping director James Mangold—whose varied credits include Kate & Leopold, Identity, Walk the Line, and 3:10 to Yuma—once again applies himself with pleasant results. 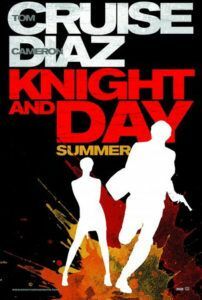 Beyond the inexplicable title (namely the meaning of “Day”), Knight and Day is effortless fun that doesn’t tax the brain too much. It could have been much better by cutting unnecessary scenes (like those with Roy’s parents) or choosing a less popish song to play over the end credits, but as is the film is harmless and quite enjoyable. 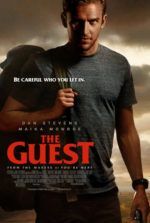 Though it won’t hold up under a closer inspection of the plot, its fast-paced nature lends an almost perfect blend of laughs and action for the summer moviegoer.